James T. Shields (clarinet) and Conor Hanick (piano) take a breather at Club Beethoven’s June 5 debut. When I found out I could hear live classical music and drink a beer and not get up “really early” on Sunday morning, I was totally in. Club Beethoven is the afternoon version of Church of Beethoven, the long-running Sunday morning event featuring classical music and a bit of spoken performance, usually poetry. The Club is held at Casablanca, inside the Hotel Andaluz. You can enter the spot directly from a door on Second Street. When I stepped from the heat of the blazing ball of flames in the sky into the cool dark of the club, it was about 4:15 p.m. The place was already packed and I got one of the last seats. Café chairs clustered around cocktail tables filled the room, and a few, deep, squishy numbers flanked a coffee table in the back. I recommend this area as the best (and possibly most overlooked) place in the house. I sank into one of the puffy chairs and immediately noticed that the air-conditioning in Casablanca is fabulous. There was a wine list —14 reds and 14 whites—and snacks. I checked out the audience as I waited for bruschetta spackled with Parmesan-artichoke dip. I was one of three people under 50. I worried that the event was going to be subdued and stuffy. At 4:30, host David Felberg stepped onto the stage. He began by saying Mozart would have played in a situation like this: people hanging out, having some drinks, enjoying each other’s company. Everyone laughed and cheered and raised their glasses. As the other musicians—oboist Melissa Peña, violinist Gabriel Gordon and cellist Dana Winograd—took their places for Mozart’s “Oboe Quartet in F Major,” I noticed how rowdy the noise in the place was. Conversations from across the room rose above the din of clanging dishware. It was definitely not a Sunday morning chamber music vibe. An attentive hush settled in when the first allegro began. Even still, servers scurried around, and people came and went from the room when they needed to. 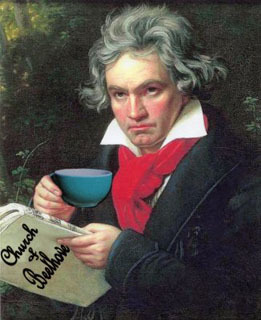 Whatever preconceived notions of classical music you have, Club Beethoven is wont to change it. You’re not trapped in an aisle, in view of a bunch of people all staring the same direction. You can lounge back, nurse a drink and let your mind wander. You can ponder the strange design choices in the room if you want to. You can make notes in a little book about your experience. The couple next to you might offer you some of their appetizers. That being said, the general focus of everyone was on the performers. Patrons of restaurants and bars with live entertainment tend to talk loudly and treat bands as background filler. But this audience was rapt and appreciative. The musicians—including Felberg on viola—were crisp, relaxed and even smiling. They seemed to relish working together as a tight ensemble. When the piece ended, the audience burst into cacophonous applause and talking—as if they were burning pent-up energy generated by the music. Next, Carson Keeble explained the music he was about to play— Keren” ffor solo trombone—and gave a little history on its author, Iannis Xenakis. The number was weird and arrhythmic. It was about the opposite of anything I came in expecting, but it was cool. The audience bent forward slightly, in suspense of what sound might come next. In that moment, I wished all my friends were there too. Whatever preconceived notions of classical music you have, Club Beethoven is wont to change it. After intermission—about 20 minutes of more raucous chatter and drink ordering—came the highlight for me. Felberg played The Red Violin Caprices,” derived from music created by John Corigliano for the film The Red Violin. The technical operator took all the lights to red, leaving Felberg to tear through the challenging piece like a frenzied, blood-hued maniac—he played like he was on fire and the lighting gave the illusion that he was. The audience shouted and whooped appreciatively. For the final performance, we were served selected movements from “John’s Book of Alleged Dances for String Quartet and and Pre-Recorded Tape.” Everyone in the room was cheerfully riled up by this point. When someone’s cell phone went off, one of the musicians mimicked the sound with a violin, getting a big laugh. It was a fitting snafu for the piece: Two violins, a viola and a cello played along to recorded beats and clicks produced from an iPhone. I loved it. The audience loved it too. Club Beethoven is a totally rewarding way to spend an hour and a half on Sunday afternoon. You’re likely to leave with a new appreciation for classical music, both familiar and not—even if you just came for the beer and air-conditioning.